AlteredFocus.net – Lights, cameras, MEMORIES! I remember the first time I brought my daughter to see Santa at the ChrisTown Mall in Phoenix, it was in 1988. The tiny voice I was so accustomed to hearing grew in magnitude much like the Grinches heart grew at the end of the cartoon we all remember. In this case the voice was from inconsolable fear! After much effort, we managed two Polaroid pictures that still have a place of honor in our photo album. My fondest memory as a youngster of the pre-Christmas visit from Santa Claus was at my father’s company Christmas party. (This was the ‘Family Party’ of course, no drinks or unseemly behavior was tolerated.) Dad was something of a big shot at his company, having nearly 200 folks reporting to him. I was considering this time in my past and realized the four of us kids never waited long to actually sit on Santa’s lap, few kids were ever ahead of our “special time” with the Bard of the Wishful Considerations. On this occasion, with great fan fare and music from a live marching band, Santa arrived in high style via helicoptor! What a glorious way to make a ‘forever’ memory, even the parents were in awe of that grand entrance. In fact, mom can still describe it in amazing detail to this day. Children still line up to ask Santa Claus for special gifts. Hopefully, mom and dad are listening and taking notes. These are times when Christmas Wish Lists are more expectations, then gift buying guidelines. How quickly we get caught up in purchasing exactly what junior or lil’miss want for fear they will be horribly disappointed. This has been my yuletime challenge for some years now. As I lament my place in the universe, for not being ‘Gates’ rich, unable to buy my kids all manner of gifts without consideration to limits, my daughter calls me, suggesting she and I go ‘half-sies’ on a gift for my son. There is a God! She offered me a chance to contribute to the perfect gift for my preteen son, a current and very popular video game! I took this opportunity to secure her list of demands for a memorable ’07 Christmas, to my surprise she had none. None? I’m nearly speechless. Her only request was for some additional supplies for next semester’s college classes. A tear came to my eye. It seems like just yesterday, after her first Santa ordeal, that she clung to me with a choke hold that would impress a WWF champion, and now she was settled enough to give a wonderful gift to her brother without expectation of something in return! And to think, for all of my planning and good intentions, it’s still Santa’s lap that is most memorable about this time of year for me. 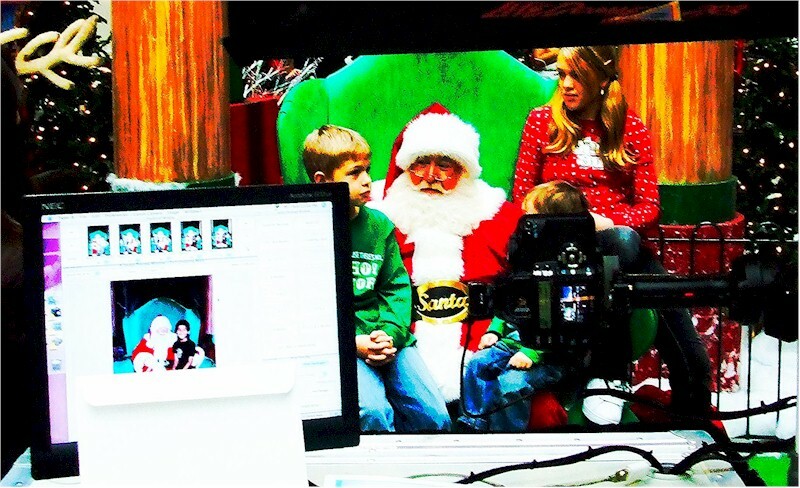 I think this Christmas it will be lights, camera… MEMEORIES! Thanks for reading this far. Ho, ho, ho! Merry Christmas! What a lovely memory Tim. It goes to show that on some, the meaning of Christmas is not lost nor are those souls. Merry Christmas!!! That is so sweet,…I agree–you must be sooo proud of your daughter. So refreshing to hear positive stories about girls her age. Right now it seems that many of the girls her age seem so pretentious and focused on material things. She has a heart,…and how pricelss is that? My daughter did the same thing, asked for nothing but plans to buy stuff for her little brother. And said little brother wants, aaaaargh, a playstation 3. $500+. Ouch. It stills seems like a bloody lot of money for a game system. "But mom,' he whines, 'it is 80 mg. you don't understand the capacity." I understand the hit on the wretched plastic card. Ho ho ho. See there…you did good!!! What nice kids who know the real meaning of caring for others!! Enjoy your first Christmas as a married couple, too!! !